Some people may call us crazy, but we’re the ones who will happily drive across town just to find one special ingredient to try and share with friends and family. You do that too, don’t you? That’s what I recently did to find these green fuzzy pods called green almonds. Believe or not, until a few days ago I had never heard of green almonds. My Lebanese-American friend currently living in California texted me a photo of one of her favorite snacks and said, “you must try this seasonal delicacy, soon!” You see, green almonds are only in season for a tiny whisper of time, at the beginning of spring, before their fuzzy shells harden and start looking more like the almonds most of us already know. 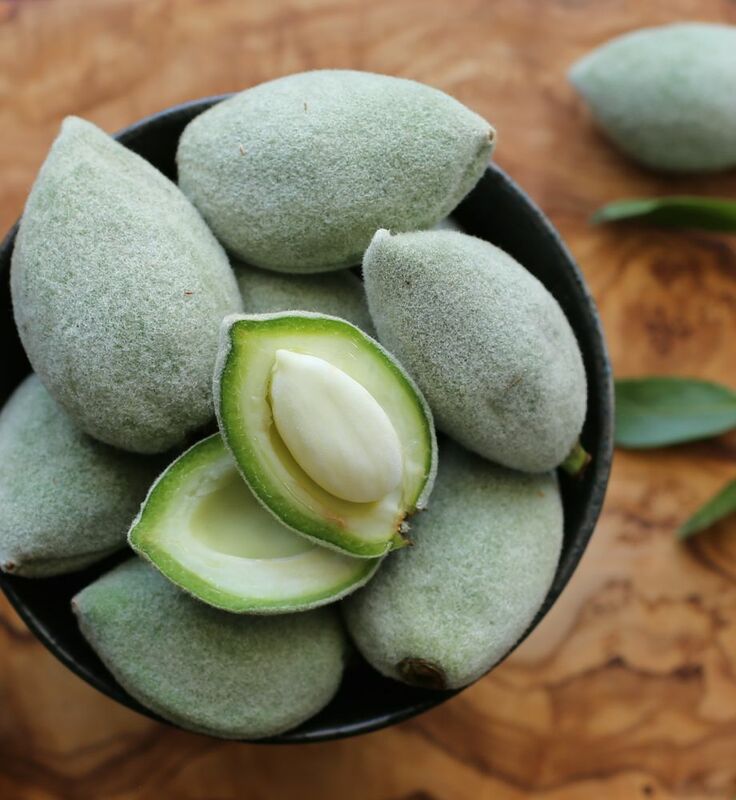 In the U.S., unless you live in an almond-growing region like California, it’s unlikely that you’ll come across green almonds at your local market, but check around. You might be able to find them at specialty markets that ship them in, as I did. I found mine at a Mediterranean market. Try to buy them fresh. Although they’ll keep refrigerated for a few days, they’re best eaten right away because their tartness eventually turns bitter. Their outer hull should be light green, with no brown spots. 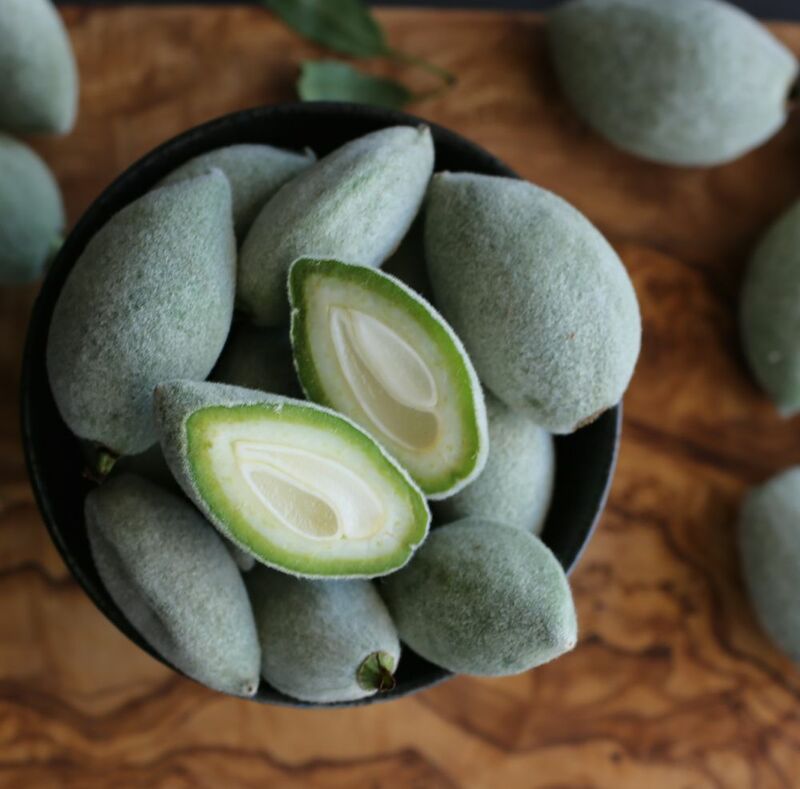 Amazingly you can eat the entire green almond—fuzzy hull as well as the soft pale seed that’s filled with an interesting gelatinous substance. They’re flavor? I was surprised to find they’re crisp and tart, similar to a green mango. They can be eaten as is, or tossed in olive oil and sea salt—my preferred way to eat them. I’ve also heard they make a nice addition to spring salads. 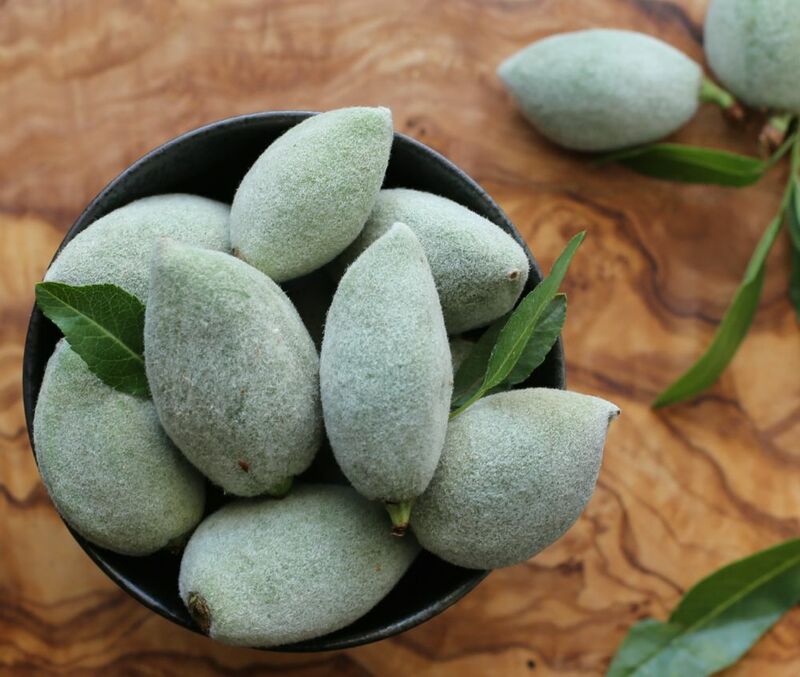 So how do they compare nutritionally to more familiar looking almonds? Apparently fresh green almonds provide the same nutritional benefits as dry roasted almonds. These include protein, dietary fiber, vitamin E, calcium, iron and a trace of vitamin C.
To my dear friend Pascale, thank you for introducing me to these little fuzzy green delicacies! And to you, my friends, who may not have had the opportunity to try them yet, be on the look-out for these seasonal gems! Don’t wait too long because they’ll only be around another week or two! Have you tried green almonds before? How do you like to eat them? Wow! Are they really almonds? I wonder where I can find these? Whole Foods? And I’m curious what nutritional value they hold. I found mine at a Mediterranean Market. Cool huh? Just looked it up. Apparently fresh green almonds provide the same nutritional benefits as dry roasted almonds! Will update the post to include that, thanks!! Lovely pictures. I had my first green almonds dipped in salt when I was working in the Middle East. A strange experiment at first, but then I got used to it. I hardly ever see them where I live in Northern France, but they can occasionally be found… I’ve seen recipes for Persian stew calling for green almonds, I’d love to give it a try some day. Thank you Darya! I agree, green almonds do taste a bit strange at first. The more I nibbled, the more I got used to them. I heard markets in Paris often carry green almonds when in season. I’ll have to look up the Persian stew ideas. Sounds interesting! Oh wow these are amazing – I’ve never tried these but would absolutely love to! Hi Millie, you better look around quick! 😉 They’ll be gone in a flash! Good luck!! You’re very welcome! Fresh pistachios sound quite interesting too. What is the name of the Persian store in Rockville, Asadur? Or is there another store? It’s Yakta. They also opened a restaurant next door. Hello, thanks for your comment! I hope you’re able to try them too! 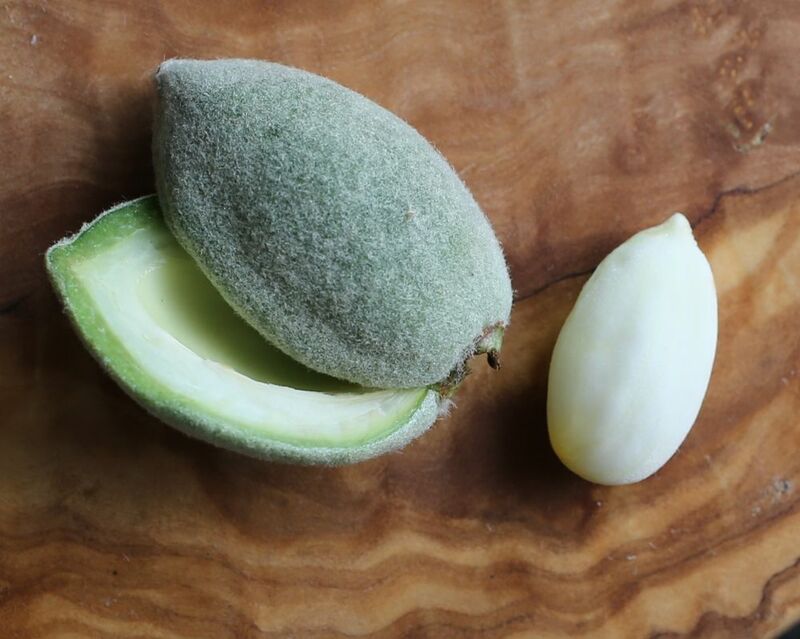 Just to be clear, the nut inside green almonds is quite soft, and within that seed is a gel-like substance. Grinding them for flour is not a possibility. Also, green almonds are not sweet. I mentioned they are tart, like green mangoes. I was referring to unripe mangoes which are normally green and very tart! They’re not sweet at all. For macarons, it would be best to stick to regular almonds and the almond meal/flour they can produce. All the best!